Facial cleansing brushes are all the rage these days! They’re way better than cleaning your face with your usual hand-and-soap practice. With a facial brush, all the dirt clogging your pores will be removed from your skin, thereby making you feel super clean, refreshed, and younger-looking. Not all facial brushes are created equal. While most of them are designed to stick to their primary purpose – which is to deep cleanse – others are built to serve other purposes. These multi-functional brushes have multiple types of brush heads such as pumice stone and a soft sponge. Here, we’re giving you our top picks of multi-functional cleansing systems. So far, this battery-operated facial brush has the highest IPX waterproof rating that we’ve seen – at IPX7. That means you can immerse it in water and still remains intact. 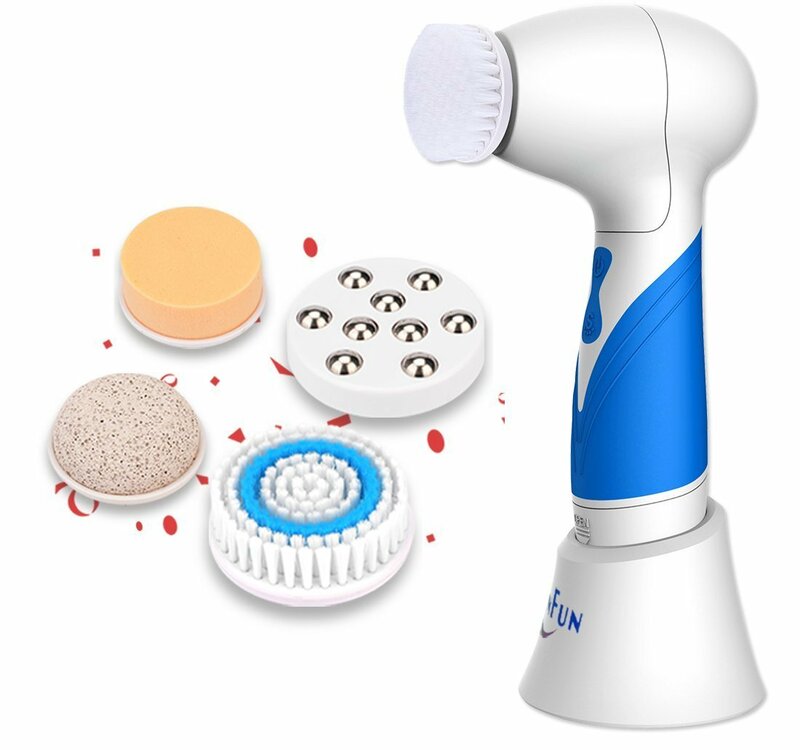 When you unbox your package of the Skinfun SKF210 facial brush, expect to get 5 different brush heads designed for a special purpose – facial brush head, body brush head, sponge head, pumice stone, and metal massage attachment. With these attachments, the Skinfun SKF210 is not just a facial brush. It also acts as a body scrubber, massager, and callous remover. 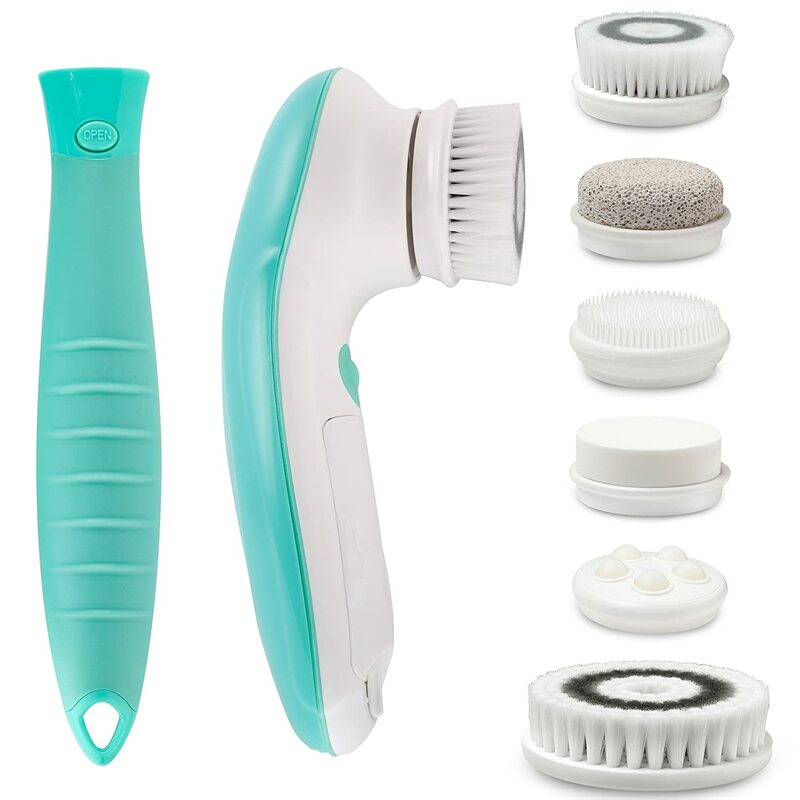 Spa Sonic‘s 4 interchangeable heads – a large body massger, a pumice stone, a small face brush, and a face sponge – are perfect for people looking for an exfoliating face brush. Choose from 5 colors – white, tangerine or orange, orchid or purple, black, aqua or blue, and pink. The Fancii FC-FB7X1 brush has 6 brush heads (face for daily cleansing, pumice for removing rough skin, foam for gentle exfoliation, body for deep scrubbing, silicone for dry or sensitive skin, massage for improving circulation)! As if that’s not enough, the box also comes with a detachable handle to help reach hard-to-reach areas of your body. Couldn’t get more complete than that!